Goodreads says, "The enthralling first book behind Poldark, the major new TV series from Masterpiece on PBS... In the first novel in Winston Graham’s hit series, a weary Ross Poldark returns to England from war, looking forward to a joyful homecoming with his beloved Elizabeth. But instead he discovers his father has died, his home is overrun by livestock and drunken servants, and Elizabeth—believing Ross to be dead—is now engaged to his cousin. Ross has no choice but to start his life anew. Thus begins the Poldark series, a heartwarming, gripping saga set in the windswept landscape of Cornwall. With an unforgettable cast of characters that spans loves, lives, and generations, this extraordinary masterwork from Winston Graham is a story you will never forget." Ross Poldark returns to his home in Cornwall, England after the Revolutionary War expecting to pick up where he left off a few years ago. He had an informal understanding with his girlfriend Elizabeth and it appeared she was going to wait for him. Instead he returns home to the fact that his father has died, his family's home is in shambles and Elizabeth is now engaged to Ross's cousin, Francis. He has two choices: he can start over somewhere else or pick up the pieces here in Cornwall. Of course his uncle wants him gone (who really wants the good looking ex-boyfriend of his son's betrothed to live nearby?) and Ross is devastated by Francis and Elizabeth's relationship, but he realizes he has a responsibility to the people and the land. He even resurrects the old mines on his land in order to restore things to they way they were. While mending his heart as well as his land, Ross meets and rescues a poor girl named Demelza. Slowly she creeps into his life as well as his heart. 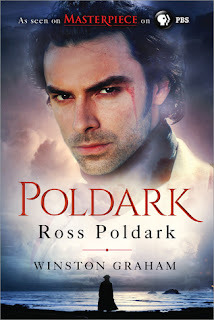 Ross Poldark by Winston Graham reads like a classic. It's smart, heartwarming, romantic and charming; in fact, I'd say it's reminiscent of Jane Austen. I highly recommend it for fans of the new show on PBS as well as lovers of historical fiction. Ross is my kind of hero in Ross Poldark. He's like a tougher and naughtier Mr. Darcy. He is bold, determined, broody at times, and opinionated. He does what he wants as opposed to what he SHOULD do or what acceptable society deems as the appropriate response. His one downfall is Elizabeth and she put him through the ringer. She didn't wait for him after the war, because everyone conveniently thought he was dead. Then he returns home having to watch her with Francis and his feelings just stew as he witnesses what he thinks is their happiness. Things start looking up for Ross when he restores the land, the farm, and the mine. As he heals the land, he starts to heal himself in a way and then enters Demelza, a poor girl that he rescued from unfortunate circumstances. He offered her a job as a servant, but also acknowledged the fact that she was young and could return to her father if she wanted. However, the life with her father was abusive and she wants to escape that life and where better to do that than at Ross's home in beautiful Cornwall. Demelza, a feisty and whimsical girl, slowly grows up to be a beautiful young woman right before Ross's eyes. Many gossipers say that he only "rescued" her to have his way with her, but their relationship has never crossed the line until one day he notices her as more than just a servant girl. Without giving too much away, I thoroughly enjoyed the slow burn between Ross and Demelza in Ross Poldark. She is one of my favorite characters and I was rooting for her from the beginning. There are many rivalries in Ross Poldark including both family members as well as acquaintances. He has a rivalry with Francis, for obvious reasons, but also George Warleggan, a local banker. The rivalry with George will prove to one that follows him for sometime. Also, his uncle is also really unsupportive of him unless he does exactly as he tells him, so the only real family member that is genuine is his cousin Verity and I enjoyed their true friendship. Poor Verity has been dealt a tough hand in life; I am still hoping she gets her happy ending. The setting of Ross Poldark is another aspect of this book that I loved. Cornwall seems like a gorgeous and magical place.....the ocean, the cliffs, the meadows...I loved it all. If you watch the TV show on PBS, you know how absolutely stunning the visuals can be. In sum, if you are fan of historical fiction and Austen-like stories, you must check out Ross Poldark. I can see why after many years there are still legions of fans. I hope to pick up book two, Demelza, so I can find out what happens to these beloved characters. 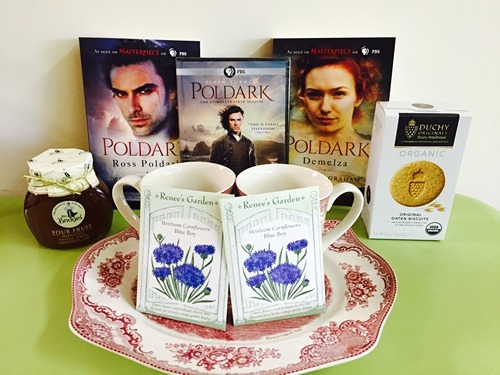 And don't forget to visit the rest of the tour stops on THE ROSS POLDARK BLOG TOUR! I'm enjoying the TV series. Ross Poldark is everything one could wish for in a literary hero. I read the books several years ago, old tattered pbs. Would love to have a beautiful new copy for my keeper shelf. I know, right?! I definitely want a new copy as well. I am looking forward to reading book two. Thanks for visiting, Linda! Me too. The books are a must if you are a fan. Thanks for visiting, Denise! I am loving Masterpiece Theatre's Poldark. I can't wait to read the books. I really enjoyed Ross Poldark and can't wait to read book two, Demelza. Thanks for visiting, Caryl. Thanks, Elizabeth. I'm glad you agree with me. Thanks for dropping by! Christina, this is so exciting! I'm so glad to hear that you enjoyed the books; such a great review and giveaway!! Thanks, Tara! I hope you can watch the show soon! It's fantastic. Thanks for visiting. I know, right?! I have done that a lot lately. It's the best! :) Thanks for visiting, Jenny! Me too. I think it's really well done and I look forward to it every Sunday. Thanks for visiting, Melissa! This show sounds awesome! I need to see it and read the books! Wow! Yes, definitely! The books are surprisingly good. I hope you get your hands on a copy! Thanks for visiting, Nadia! I think the show is fantastic so far. I love Ross and Demelza but I'm not a fan of Elizabeth at all. Hope he can finally put her out of his mind! I LOATHE Elizabeth as well. I really, really can't stand her. That's why I am glad Demelza is so witty and snarky...she stands up to Elizabeth eventually. Haha. He sort of does, but he is so darn good looking in the show though! Thanks for visiting, Christina! I love Antiques Roadshow on PBS on Sunday nights. However, I love Poldark much, much more. I can't wait to read the books. Great post! Both are great shows, aren't they? Thanks for visiting, Dawn! Thank you so much for your in-depth review of the first book in this series. I love watching the TV series and will definitely read the book series when it's done! Thanks for checking out my review, Susan. It's so much fun to read the book and then watch the show. Thanks for visiting! Haha. YES! It's so much fun to read it while watching the show. Now that we know season two is confirmed, I will have to read Demleza (book two) sooner than later! Thanks for visiting, Melanie! Great review Christina. So glad you enjoyed it. Ross Poldark is a complex hero that I have grown to love. Thanks, Laurel! YES! He is one of my favorites...right up there with Jamie Fraser. Thanks for having me be a part of this blog tour. I love books that have series on tv or movies to go with them. Just a little extra oommph. Ross Poldark is a total babe in both the 70s TV series and the new version, so I just know I'll love the book version too. Great review! I'm not sure how anyone could resist a "naughtier Mr. Darcy" LOL! Ross Poldark is more and more becoming a fictional character I want to get to know as he seems to be honorable and loyal. I missed the beginning of the series, as I was away, and so am waiting to start it from the beginning. The books are on my wish list. I loved your review! Poldark...so swoon worthy! I love the series on PBS. Can't wait the read the books. Hope I get lucky in this fab giveaway. Thanks for hosting! I am loving this series!!!! The books would be well worth the time. Thank you for hosting in the giveaway! Great review! I have been enjoying the Poldark series on PBS but haven't read the books yet. Looking forward to reading them soon. Thank you for a great review. I love Ross Poldark/Aidan Turner. Such a great series and I'm looking forward to reading the books. The show is so enthralling! Cant wait to read the books I hear they are soo good! Thanks for posting! I adore this show! I can't wait to read the books. Thanks for the chance! We so much look forward to Sunday nights now. This series is both exciting and thoroughly captivating. Thank you so much, Christina, for your great reveiws. my daughter & I love Sunday nights watching PBS, this show is amazing and we look forward to next season-it can't come soon enough!